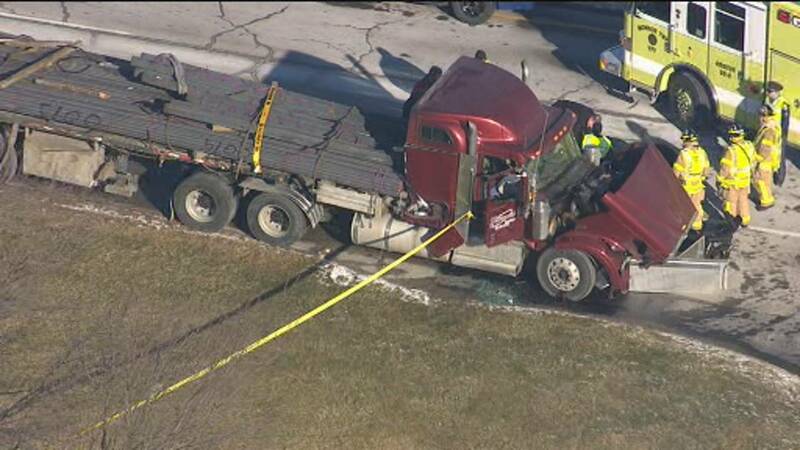 MONROE TOWNSHIP, Mich. - A 54-year-old man was killed Monday when a pickup truck driver abruptly changed lanes in front of his semi truck and caused a crash in Monroe Township, according to authorities. Michigan State Police troopers were called at 6:36 a.m. Monday to a two-vehicle crash near the intersection of South Custer and Herr roads, officials said. Police said a semi truck, a pickup truck and a passenger vehicle were heading east on South Custer Road. The semi was in the right lane and the passenger vehicle was in front of the pickup truck in the left lane, authorities said. When the passenger vehicle stopped for the red light at Herr Road, the pickup abruptly moved into the right lane, police said. The semi hit the back of the pickup truck, causing the semi load to smash into the cab and strike the driver, according to officials. The semi truck driver was pronounced dead at the scene, police said. The driver of the pickup truck was taken to Beaumont Hospital in Trenton to be treated for non-life-threatening injuries, officials said. South Custer Road was closed for police to investigate the crash. Anyone with information about the crash is asked to call Michigan State Police at 734-242-3500.